I attended a dinner about a week ago in which the tables were so beautifully set. They were stunning from the moment we laid our eyes on them. Set atop a long natural burlap runner, the fruit placed throughout the table was so vibrant and fresh. 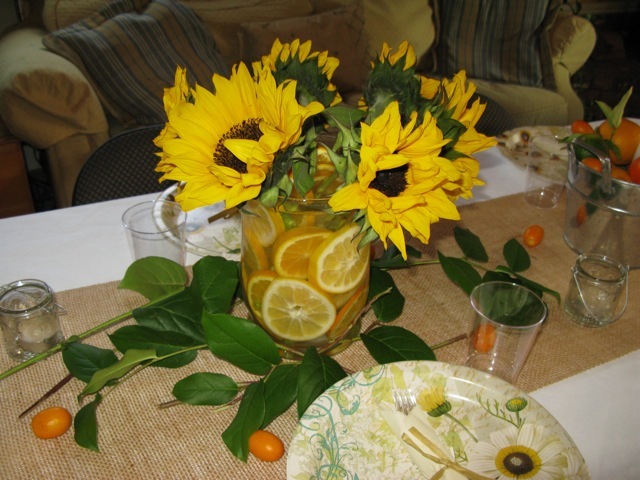 The sunflowers added an element of delight as did the bright silver buckets. 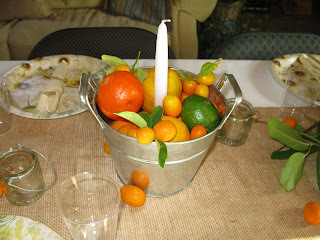 Because there were over 25 of us at this dinner, paper plates were used. The nature design featured a bird and flowers that complimented the whole ensemble. We shared a delicious salad and cheese bread much like the legendary bread served at The Smokehouse in Burbank, CA. Look for my rendition of that recipe in a future blog :-). I warn you, it's addicting! Our dessert was a scrumptious strawberry shortcake. I hope you enjoy the beauty of these tables as much as we did. My sisters and I didn't know we grew up poor until we got older. When my mom served Tuna Noodle Casserole we felt very well-to-do. I revised her simpler version recently and it was quite a hit. Everyone had seconds! 2 Large Cans White Chunk Tuna, packed in water (I like Bumble Bee brand). 1/2 of a chopped onion (not sauteed). Once mixed together, pour into an oil-sprayed 13 by 9 inch casserole dish. Cover with crushed potato chips, shredded pepper jack and cheddar cheese to cover. Bake at 350 degrees for about 30 to 40 minutes, until it starts bubbling and cheese is melted. This is one of my favorite home-cooked casseroles. It's absolutely delightful! 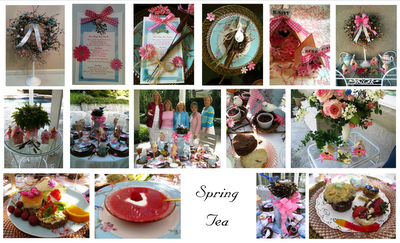 I have compiled a pretty full set of pictures from a Tea I was very fond of hosting. Springtime seems to be the right time to re-introduce this to my new followers. A wreath with "Happy Birthday" ribbon was a pleasant greeting. The next two pictures are the Menu Card (See wording on a previous post of this Tea: "Trina's Happy Bird-Day Tea"
The pretty bird awaits her guests. Another birthday greeting posted on wooden bird houses. The tea pots are ready! 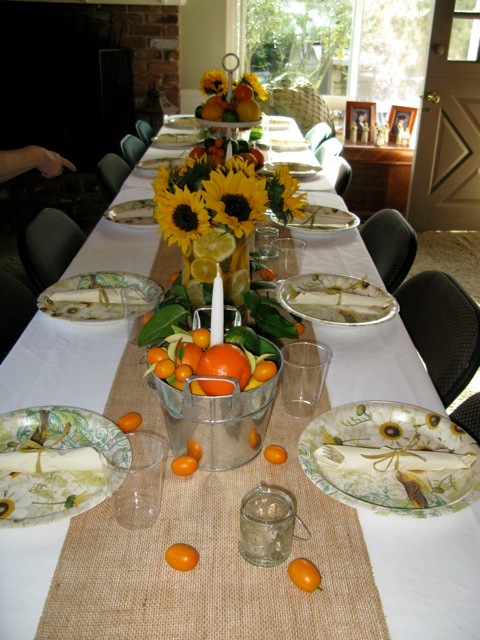 The table awaits its guests. The treasured guests, minus Janice who took the photo. Chocolate, chocolate chip scones and cream scones accompanied by the seeded raspberry jam. Floral display and Bird Book. And last, but certainly not least, the Sweet Tweets. If you would like additional information, please post a comment or view other blog posts within this blog. Thanks for visiting. Have a delightful day!